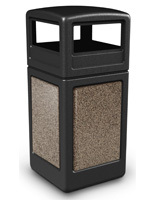 This stone panel recycle bin is beige in color to complement indoor or outdoor areas for green campaigns. Constructed of steel and plastic polyethylene, this trash can is made to withstand most outdoor weather conditions but also looks great inside office buildings and the like. 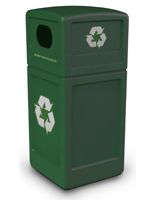 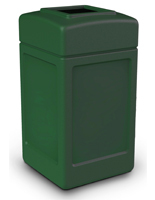 This waste bin is eco-friendly in that it is made with 25% reprocessed materials and also includes green campaign decals to clearly identify sustainability requirements. 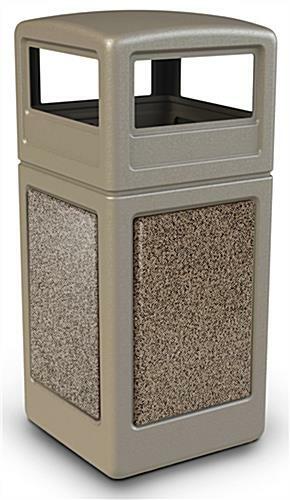 The large capacity 42 gallon trash can features a locking dome lid to conceal the trash and odors inside. 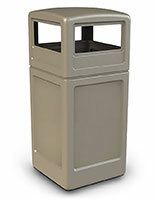 Access can be reached on either side of the bin for convenience. The 7 included trash can decals allow personalization of the plastic container’s purpose to keep commercial areas clean and provide a professional appearance. 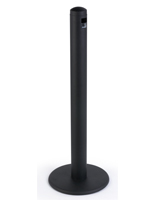 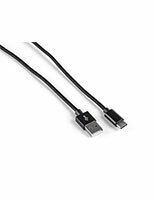 18.5" x 41.8" x 18.5"